The Plough Inn Golf Society, the PIGS, play some 7 events during the year on courses in the South East of England. Trophies and prizes are awarded to the successful players. Our members have a wide variety of handicaps, from 4 to 28 (the maximum allowed). These handicaps are revised during the year to take account of success or otherwise in our events. In this way we see a wide distribution of awards. 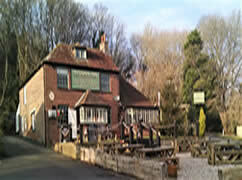 Although linked to the Plough Inn at Crowhurst, the Society is not exclusive to residents of the village. The main criteria of the Society is to ensure enjoyment of both golf and social gatherings. Members are encouraged to participate in the organisation of some of the events.